Is there a better alternative to Meal Planner? Is Meal Planner really the best app in Cooking category? Will Meal Planner work good on macOS 10.13.4? Meal Planner provides hassle-free grocery shopping experiences. Meal Planner plans meals for any week in the calendar. You can create meal types and meals. The best feature is automatically generating the grocery list for any given week! Grocery lists can be generated based on ingredients that you define in the meals you create. 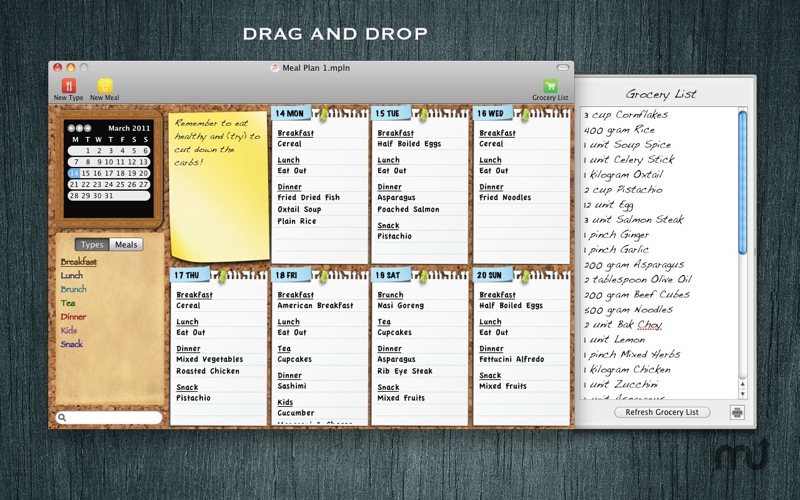 Easy drag and drop meal planning! Meal plan based on meal portion. Grocery List generated based on meal portion. Meal Day View highlight color more visible. Meal Planner needs a rating. Be the first to rate this app and get the discussion started!